Ukadiche modak - steamed modak or sweet dumplings are made as an offering to Lord Ganesh on the occasion of Ganesh Chaturthi and on Sankashti chaturthi. Ukadiche means 'cooked by steaming' in Marathi language. Modak is the particular shape of this item, it is a bundle shape. Lord Sri Ganesh or Ganapathi, the elephant headed Indian god, is worshiped on all religious occasions. But the Ganesh chaturthi day it is his special day, his birthday. There are many other sweets made and offered to Ganapatibappa on this festival and modak is his favorite. Sankasti chaturthi is once a month. It is a day when people fast the whole day and then have a meal after the moon rise, after taking a look at the moon. Naivedya is offered to the god's idol and then the meal is consumed. Some traditional sweet, such a kheer is made for this meal. Modak is also made on the 'Angaraki Chaturthi' day (on a fasting day) as an offering to Lord Ganesh. 'Angarki chaturthi' is the Sankashti chaturthi day which falls on a Tuesday. In 2016 Ganesh churthi is to be celebrated on 5th September. Ganesh chaturthi is celebrated in many parts of India but in the western state of Maharashtra, it has a special relevance. There, it is celebrated for 10 days. It is a religious as well as social celebration. The ganesh chaturthi festival starts on Bhadrapad Chaturthi (4th day in the month of Bhadrapad according to the Indian calendar) and ends 10 days later on Anant Chaturdashi day. Modak is a bundle where the outer shell, the covering, is made generally with rice flour for steamed modak or with wheat flour for deep fried variety. 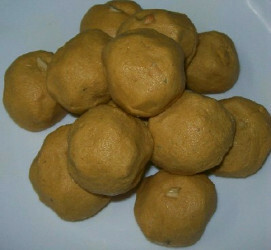 Mava modak is also available, in which the stuffing is made with milk solids. Steamed or fried Modak is a favorite of Lord Ganesh and is a specialty of Maharashtra. It is also prepared in Karnataka. The special shape has the name of modak. The Karnataka modak may be made the shape of a 'Karanji', a 'half moon' shape and that is called as 'kadabu'. What ever name or shape, modak is wonderful. Modak is made by steaming or by deep frying. The deep fried modak can be kept for a few days whereas the steamed modak should be eaten within a day or two. The preparation is simple(though a bit long) and the recipe needs very few ingredients. The filling is very easy to make. The fried modak covering is easy but the covering for the steamed modak, which is a healthier version of modak, is a bit tricky. Here I am giving your the recipe for the steamed modak as I like to make this healthier version on a Ganesh chaturthi day. The preparation for ukadiche or steamed modak starts 2-3 days earlier. 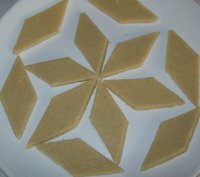 You may prepare the covering rice flour at home or you may use the ready-made rice flour available. The homemade rice flour gives better results. The rice used for making this rice flour may be basmati or ambemohor, jasmine rice or any white rice. The fragrance of the rice adds taste to the final modak. So use a good quality rice. Wash 1 1/2 cup rice and drain immediately. Spread the rice on a thick absorbent cloth and let dry completely in shade. Grind this rice to a fine powder in your mixer or give it to the flour mill (if you have one in your area) to get it ground. 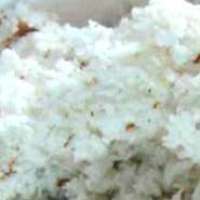 This rice flour is used to make the covering for modak. Step by step instructions to prepare covering dough for Modak with rice flour. Heat water in a deep pan. Add salt and a teaspoon of vegetable oil or ghee to water. When water starts boiling, reduce flame and add rice flour. Stir to mix. Cover and cook for 2 minutes on very low flame. Switch the stove off. Keep the pan covered for about 10 minutes. Let cool a little. The mixture would have become thick. Dip your fingers in oil and knead the dough till it is smooth. (using a little oil if necessary). Keep covered with a moist cloth. Your modak covering is ready. Now let us make the coconut filling for modak. Step by step instructions to make the coconut filling for modak. Heat a thick bottomed pan. Add scraped fresh coconut and jaggery and Mix well. 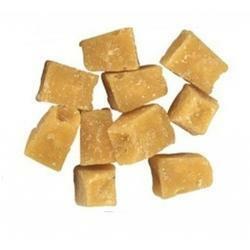 Keep stirring and cooking till jaggery melts. Cook for about 4-5 minutes. But do not let the mixture go dry. The mixture is still watery after 4-5 minutes of cooking, add 1 tsp rice flour and cardamom powder. Mix well. Cook for another minute. The mixture will thicken a little when it cools. Divide the covering in lime sized balls. Smoothen each ball using your palms. Flatten it into a disc using your fingers. The sides should be thinner than the center. 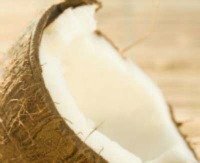 Take a spoonful of coconut filling and put in the center of the flattened dough circle. Fold the edges in 4-6 pleats and bring them together to close the modak, giving it a bundle shape. Make other modaks in the similar way. Handle the modak carefully as they may tend to break. Heat water in your steamer / steaming pot. You may use the idli maker too for steaming modak. Place 4-5 filled modak in it and steam for about 8-10 minutes. Remove carefully with a wide spoon as the covering may tear with rough handling. Put on a plate and let cool. Make all the modaks and steam them in batches. Serve ukdiche modak hot with a little ghee. These steamed modak taste good even when cold. You can keep them in the fridge for 2 days in airtight container. Handle the modaks carefully when hot. They are delicate. 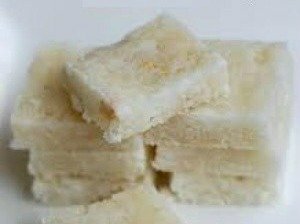 The color of the outer covering will depend on the quality and color of the rice.The color of the coconut stuffing will depend on the quality and color of the jaggery or sugar used. If you don't have a steamer, you may use a pressure cooker bottom vessel or any large vessel. Do not use the pressure cooker weight. You may use the lid or use a plat to cover. Add water at the bottom of the vessel. Put a trivet and then a perforated flat plate pan on it. You may put a thin cloth at the bottom of the perforated plate or a piece of banana leaf also may be used. Put the filled modak on the cloth or the banana leaf. The cloth or the banana leaf prevents the modak sticking to the perforated plate.